A University of Central Florida biologist whose groundbreaking work tracking the movements of sea turtle yearlings in the North Atlantic Ocean attracted international attention has completed a similar study in the South Atlantic with surprising results. South Atlantic sea turtles do not passively ride prevailing currents as historically assumed, but instead actively swim and orient to keep themselves offshore. Depending on whether they hatch early, in the middle or late in the sea turtle hatching season, they travel in different and sometimes opposite directions, including into the Northern Hemisphere. The team’s findings are published today in the Proceedings of Royal Society B. This study was a collaboration between UCF, Brazilian sea turtle conservation group Projeto TAMAR, and the National Oceanic and Atmospheric Administration Fisheries. The study of turtles in the South Atlantic helps build knowledge about the sea turtles’ “lost years,” the time after they hatch and head to sea, and before they return closer to shore as large juveniles several years to as much as a decade later. Very little is known about these young turtles during their early years at sea. “This study helps fill some long-standing data gaps in our knowledge of the sea turtle life cycle among Brazilian turtles,” said Milagros Mendilaharsu, a co-author with Projeto TAMAR. Young turtles have to survive several years in the open ocean and a couple decades in coastal waters before they reach maturity and can contribute to their populations, Mansfield said. Sea turtles are very late-maturing and long-lived creatures, which makes knowledge and understanding of the “lost years” challenging. 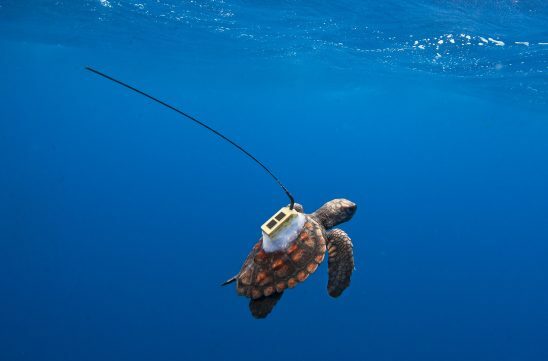 The team tracked 19 loggerhead turtles for more than 120 days off the coast of Bahia, Brazil. Turtles in the study were released early in the hatching season when prevailing currents are to the south, in the middle of the hatching season as currents begin to switch from north to south, and late in the hatching season when offshore currents head mostly to the north/northwest. Passive floats, or oceanographic drifters, were released with the satellite-tagged turtles to test for their swimming behavior. The floats also served as a comparison between the turtles’ behavior and known passively drifting objects that would move with the currents. The team found that early in the hatching season the majority of the turtles followed the strong southward currents. The turtles released in the middle of the season initially moved southward and three eventually veered to the north as the currents shifted. All drifters accompanying these turtles beached within a month, yet all turtles remained offshore. Late in the hatching season, when currents flowed to the north and west, turtles uniformly moved north and northwestward across the equator. Mansfield said that active orientation combined with swimming behavior helps the turtles remain seaward of the Brazilian continental shelf instead of allowing themselves to be driven toward land like the drifters. “Biologically speaking, this is fascinating,” Mansfield said. Mansfield’s 2014 study, which looked at North Atlantic loggerhead turtles, gave some of the first insights into these “lost years.” In that study, many of the tracked turtles unexpectedly left the currents associated with the North Atlantic Subtropical Gyre, a large, circular current system in the North Atlantic Ocean, and entered the Sargasso Sea, an area inside the gyre. A similar gyre, the South Atlantic Subtropical Gyre, exists in the South Atlantic, but the sea turtles in the south did not act the same. Unlike some other populations that have undergone dramatic declines or increases, these seem to be pretty steady – much like money invested in a diverse suite of stocks” said Putman. With improving technology and miniaturization of satellite tags – such as tags developed by the ICARUS Initiative that Mansfield intends to deploy as part of the next steps in her research – the researchers said it will be exciting to learn more about these young seafarers. To learn more about sea turtles, followthe UCF Marine Turtle Research Group and Projeto TAMAR on Twitter (@UCFTurtleLab), Facebook (https://www.facebook.com/ProjetoTamar/ or https://www.facebook.com/ucfmtrg/), Instagram (@UCFTurtleLab) and the (https://www.tamar.org.br/.